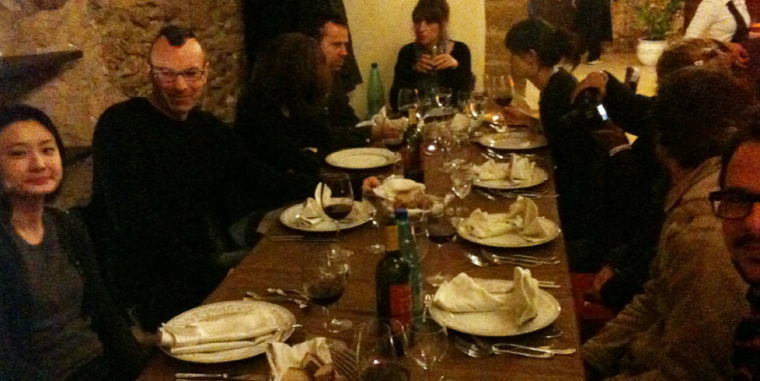 This spring various generations of architects from all over the world met one another in Selinunte, Sicily. Among them were budding talents who have just completed their first projects in their native regions, and architects from firms that operate globally. The nice thing about the gathering was that all the invited offices presented their work, which gave everyone a clear idea of the scope of work of architects and in particular of the motives underpinning their work. Especially among the younger offices it was evident that ambitions have clearly changed. Or perhaps it is more accurate to speak of a new mentality. These offices seem less concerned with the spectacular or new effects of their completed projects. Instead, their desire to achieve is grounded more in the implications of a project for its surroundings. With that, they examine the effects of architecture on society. Attention in shifting from the development of artistic talent to the formulation of social aims to which architecture can contribute. To give substance to that, they are more aware of the processes involved in making architecture and how these determine the result. That in turn means the concept is not viewed as a physical entity the greatest aim of which is to be realised as precisely as possible. Rather, it is more a way of unlocking the door to the underlying aims. This could, for example, be an area where development is impeded by the presence of slumlords, as is the case in the red-light district of Amsterdam. The Taiwanese-Dutch office Boundary Unlimited studied the causes and make recommendations for breaking the mould. One of the proposals is to relocate the prostitution to the top floors of the buildings in order to disrupt the method used to calculate the exorbitant rents that the working girls have to pay to make use of a running metre of facade. Another effect is that the public space opens up to more mixed uses and a less one-sided and overstrained urban environment. Another proposal concerns the use of the upper floors of vacant spaces as a new roof city, which can flourish on top of existing activities. The underlying idea is to foster development that benefits everyone, not just the slumlords. Whats more, it could prevent the municipality from being forced to buy out the slumlords on account of their exorbitant rents, the cost of which is indirectly borne by society. Does this mean that the beauty of architecture is accorded a less important role? I do not think so, but it is a beauty that emerges over the course of the process and that suddenly presents itself. A young architect from Design Ether in Bombay presented an example of these surprising aesthetics in the rapidly growing metropolis in India. The growth process in that city can be seen as a one-sided displacement process by which traditional low-rise development has to make way for high-rise development made possible by property investors. In the rapidly created new urban condition, existing dwellings are literally sandwiched and squeezed between new highrise developments built along the main traffic arteries. In this seemingly impossible condition a young office succeeded in building a simple housing scheme. They made a virtue of necessity with simple means and the addition of a collective space. Stepping out of the system revealed alternatives that attempt to derail the economic machinery. The result is a small oasis of unexpected beauty in a world that seems to lack all sense. This approach leads to a disruption of the customary rule and culminates in aesthetics of surprise. What many of the presented projects have in common is a seeming modesty with regard to the role of architecture. They do not deal with the promotion of a brand but with the effectiveness of an idea. Quality is not automatically linked to an individual name but with the content of a project. Many projects are therefore the result of collaboration between parties that, depending on the nature of the assignment, set up an alliance of temporary solidarity. The architects from Gilad-Shiff Architecture in Israel introduce the idea of the shared space in a country where it has been the reality for inhabitants since time immemorial. But it is precisely here that this concept of shared space acquires new meaning because the idea of sharing space together has a flexible and temporary character. By basing their projects on this alternative view of using space, the architects try to make a practical contribution to solving a big problem that usually proves insoluble owing to unattainable ideals. Something else that stuck me was the unbiased vision upon which the new offices operate. The Belgian office BLAF Architecten is a good example of an office that works in a Flemish context and uses irony faultlessly but puts up with it at the same time. They describe their world as an indefinite condition between city and countryside, in which everyone is concerned just with themselves and everything has been privatised. Without wanting to pass moral judgement on the world, they build projects that at first glance seem invisible because they blend into the local context. But they then add something very subtle that changes things a little, like a public basketball court on the site of two private homes. In a cacophony of diversity in which everybody is preoccupied with their own private property, this architecture amounts to a stealthy commentary, by means of a new type of simplicity, on the social processes that underpin the built reality in Flanders. What all generations finally seem to have in common is that they want to fully justify that small contribution they make to the world. And that justification is deemed to be something obvious, not only for the built result but also for the functioning of the building. There is apparently an ethical awareness that determines the natural motives in an unaffected way. The architects first concern is to involve the people that will have to live in the project as well as those affected by changes to their surroundings. For the success of the interventions depends on their involvement. The architects of Vicini TBR are responsible for a new urban development in the Caribbean. They provided a colony of squatters with a new and simple form of accommodation, before the commercial forces can do their work. That not only generates support in a clever way but also favours that section of the population that is always last to benefit from the normal economic processes. But taking responsibility can also be done in the way demonstrated by the French office Ia-Architectures, which argued for not building at all because it would burden the surroundings unnecessarily and to a disproportionate degree. In such cases the sustainability slogan can easily become an excuse to bring about the opposite through manipulating regulations and figures. Finally there was the office Demo, whose presentation eloquently expressed what they have missed in the architecture that has shaped the past decade: modestly, collegiality and effectiveness. In the end, architecture is about improving the material world around us by allowing beauty to emerge from the processes of change upon which it is based. That is not the same as trying to embellish the world and then hoping that society will be improved in the process. You could argue that this new generation of architects no longer sees their work as a cultural act set against nature but, rather, as part of nature. Beauty coincides with the process from which it is created. It thus escapes from the prison of quality of imagery that has trapped designers for decades and replaces it with the effectiveness of the idea. They search for the beauty of what works. Whats important is not what it looks like but what causes it, not how beautiful it is but how it works. I think that if the changed mentality is picked up and presented in the magazines, opinion can shift for the better. The importance of architecture can then come back into the limelight as a profession that brings society forward. I am curious about the way a culture that describes this can be represented! Architects meet in Selinunte is an initiative of the AIAC Associazione Italiana di Architettura e Critica and took place on March 10-14, 2010. Alex van de Beld was in attendance to make a presentation on behalf of Onix.